With a maximum real-time sampling rate of 2.5 GS/s per input, you can see what really happens, with 400 ps resolution. Both inputs have their own digitizer, so you can simultaneously acquire two waveforms and analyze them with the highest resolution and detail. If an anomaly flashes by on the screen, just press the Replay button to see it again. And thanks to the wider screen, you will always see a 12 divisions time-window – giving a far better overview of what’s happening both before and after the trigger event! Thanks to the deeper memory, very small parts of the waveform can be studied in full detail using ‘zoom’. The waveform memory of all oscilloscopes in both the 190B and 190C Series has been enlarged to allow as many as 3000 samples per channel to be acquired. This is 1800 samples more than before, giving much greater waveform resolution. You can use the ZOOM function to find tiny details in a long waveform, for example, the color burst in a video signal or a single impulse in a complex data-stream. All models also allow the high-resolution waveforms to be transferred to a PC for later detailed analysis using FlukeView ScopeMeter software. The full-color display makes identification of individual waveforms easier, particularly when displaying large amplitude or multiple overlapping waveforms on screen. On-screen color labels, measurements and warnings are clearly linked to specific waveforms. The bright, high contrast display allows for clear reading under varying light conditions. And still a 4 hour battery operation time is assured! The Digital Persistence uses multiple intensity levels and user selectable decay time -it’s as if you’re looking at the display of an analog, real time oscilloscope! The fast display update rate that’s a standard on all models reveals signal changes instantaneously, useful for instance when making adjustments to a system under test. A wide choice of automatic and manual trigger modes gives you the flexibility to capture just about any signal you’ll encounter. Connect-and-View™ triggering is ideal for fast and easy checking of multiple test-points. The manual modes include time delay, video and pulse-width triggering. A fully isolated external trigger input is included for troubleshooting time relationships between two input signals synchronized to a third signal. Dual-slope triggering used to capture the eyepattern on a digital datastream. Two new modes – ‘n-cycle triggering’ and ‘dual-slope triggering’ – have been added to the Fluke 190C Series to help you isolate the phenomena of interest. N-cycle triggering ensures you get a stable ‘live’ image of a signal, for example, in frequency dividers and clocked (synchronous) digital systems, or to synchronize on bursts of pulses. Dual-slope triggering enables the oscilloscopes to trigger on both rising and falling edges alike. This means that any edge in the signal will act as trigger event and initiate a new waveform acquisition, a most useful capability when making eye-patterns from digital data-streams, or in conjunction with single-shot phenomena. Scope users know how frustrating it is to see a one-time anomaly flash by, never to be seen again. Not with the ScopeMeter 190 Series! Now you can look back in time with a touch of the replay button. In normal use, the instrument continuously memorizes the last 100 screens. Each time a new screen is acquired, the oldest is discarded. At any moment you can “freeze” the last 100 screens and scroll through picture-by-picture or replay as a ‘live’ animation. Cursors can be used for further analysis. Or you can use the advanced trigger capabilities to capture up to 100 specific events. Two sets of 100 captured screens with individual time stamps can be stored for later recall or download to a PC. The ScopeRecord memory stores 27,500 points per input or more, for high resolution recording of events up to 48 hours, and captures fast intermit-tents and glitches as short as 50 ns. This continuous roll mode stores, for example, events like motion profiles, UPS-, power supply- and motor start-ups. All models also have a ‘Stop-on-Trigger’ in the ScopeRecord mode. This allows the ScopeMeter to store waveform data until the instrument is triggered or until a repetitive trigger signal is interrupted. This way, the instrument will, for example, automatically recognize a power failure and store the waveform data preceding it. And with 100 x zoom, you can look at the smallest details, like individual power cycles. Two of these 27,500 point recordings can be stored for later analysis. Measure from mV to kV – fully isolated and safely! The ScopeMeter 190 Series have three independently floating isolated inputs. 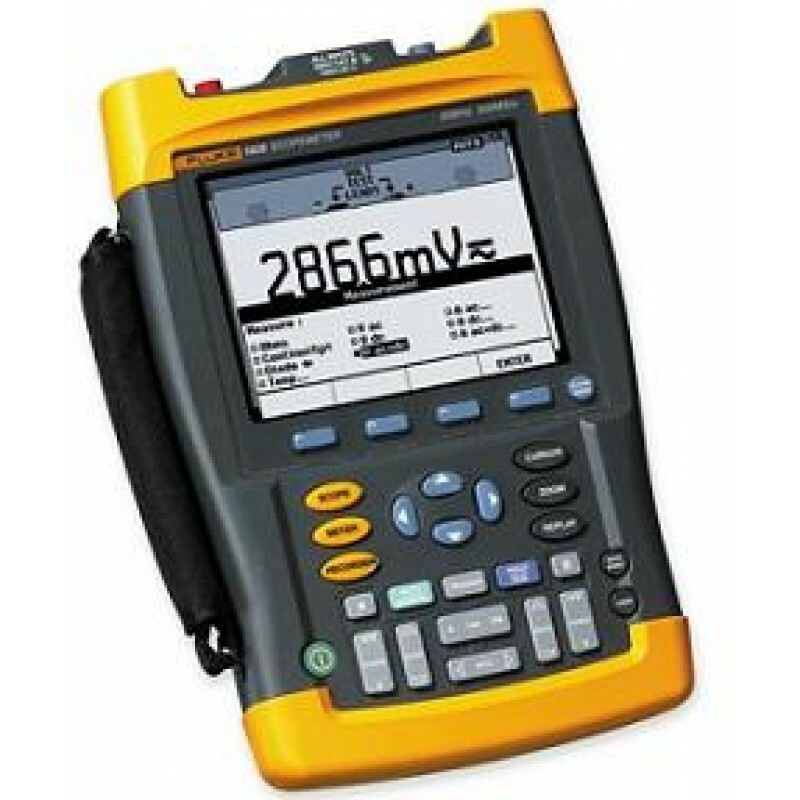 While conventional oscilloscopes can only make measurements referenced to the line power ground, measurements on each of the Fluke ScopeMeter 190 Series inputs can be referenced to a different “low” level. This enables measurements in mixed circuits having different ground references, and also eliminates the risk of accidental ground short circuits. All inputs are safety certified for measurements in 1000 V CAT II and 600 V CAT III environments. And the standard probes cover a wide application range from mV to kV, making the ScopeMeter 190 Series ideal for micro-electronics to electrical power applications. For analysis of waveforms, ScopeRecord and TrendPlot recordings, the ScopeMeter 190 Series feature 30 automatic measurements, plus cursors, zoom and a real-time clock. The analysis can be made directly or later when back in the office. Up to 2 recordings and 10 scope screens can be stored for analysis, print-out or download to a PC. Frequency Spectrum shows an overview of frequencies contained in a signal. All 190C Color ScopeMeters now include Frequency Spectrum Analysis functionality based on Fast Fourier Transformation (FFT) analysis as a standard feature. This makes it possible for you to identify the individual frequency components contained in a signal. The spectrum analysis function is also handy to reveal the effects of vibration, signal interference or crosstalk. An automatic window function assures optimal windowing, although you may manually select your preferred time window. ‘Waveform reference’ allows an acquired trace to be stored and designated ‘reference trace’ for visual comparisons, or it can be used as the reference for automatic ‘Pass / Fail’ testing (190C). Up to 100 individually matching (‘Pass’) or non-matching (‘Fail’) waveforms can be stored in the replay memory, allowing you to monitor your system’s behavior over a long period of time, without the need for you to attend! The rms-value of the noise is measured on the part of the waveform enclosed by the cursors. Automatic power and Vrms-measurements can now be performed on a specific, user identified portion of the waveform using the cursors of the Fluke 190C to define the time-window of interest. In this way, the Color ScopeMeter can measure the power within a specified time span, or the rms-value of a voltage during a dedicated period of time. The Vpwm measurement is for measuring the effective RMS output voltage of variable speed motor drives and frequency inverters. The high-sensitivity setting of 2 mV/div allows for measurements on low-level signals, that are hard to make with the average oscilloscope. The toughest faults to find are those that happen only once in a while: intermittents. They can be caused by bad connections, dust, dirt, corrosion or simply broken wiring or connectors. You may not be around to see it – your Fluke ScopeMeter will. In this “paperless recorder” mode, you can plot the minimum and maximum peak values and average over time – up to 22 days. The two inputs can plot any combination of voltage, current, temperature, frequency and phase – with time and date stamp -to help lead you to the cause of those faults quickly. Add user text to individual ScopeMeter settings – providing guidance to the operator when recalling a set-up. Waveform Compare – store reference waveforms on the PC, or send a reference back to the ScopeMeter for waveform comparison and “Pass/Fail” testing. Analysis – use cursors, perform spectrum analysis or export data to other analysis programs. ScopeMeter test tools are connected to a PC via an optically-isolated RS-232 interface cable.